Do you suffer from sore knee and find it difficult to do exercise which involve knee movements? Are you tired of trying out a number of solutions for knee pain without any beneficial results? This knee strap reduces the pressure on the patella tendon and helps alleviate pain while running or exercising. It goes around your knee, right below your kneecap, over your patellar tendon The compression fit allow you to align the patella more accurately. It helps to secure your patella and the ligaments around the knee. You will be amazed to see how much effective these are, and how quickly they provide relief. The Knee Strap fits perfectly and provides necessary support to the knees. The knee strap is fully adjustable, and thus comfortably fits almost everyone. It is designed such that your movements are not restricted and you feel comfortable all the time. It goes on and off in a snap. The neoprene padding of the knee strap provides a soft and comfortable support. Moreover, These straps have a strong hook-and-loop fastener for fastening. Have you restricted Exercises due to Knee Pain? Is your exercise limited due to patella tendinitis in the knees? 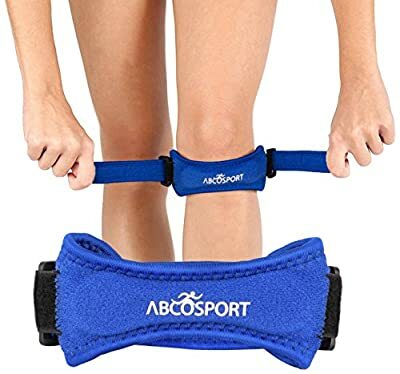 With adjustable knee strap, you can run or exercise, and do so much more and not feel a bit of a knee pain.These straps work like a charm for patella tendinitis. You will immediately feel the difference with this strap. ORDER NOW this Adjustable Knee Strap and get relief from the knee pain which restricts your physical activity.